There are two methods for carrying out GCN surveys, both with restricted timescales. GCN surveys are typically required prior to a planning application and it is strongly recommended that any sites potentially requiring GCN surveys are assessed as early as possible. Any site with a pond on site or within 500m of the site boundary may require a GCN survey. BWB can provide advice as to the likelihood of surveys being required and carry out GCN surveys within the required time period. Further information is provided below. eDNA surveys require a single water sample to be taken from each pond between mid-April and end-June. This sample is analysed in a laboratory and a presence or absence result for GCN is returned. If the result is negative, this is sufficient for a planning application. However, if it is positive, a full GCN survey is required to gain a population size class estimate. eDNA surveys are cost effective and can give a result in 1-2 working days. They are ideal for projects spanning a number of years but can be used in all situations. A PSCA survey requires the use of three different methodologies over at least four visits to determine the presence or absence of GCN. 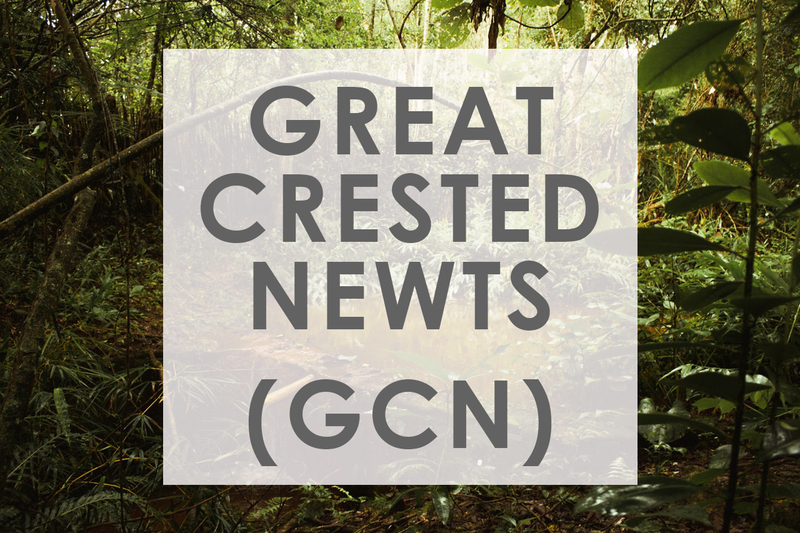 If GCN are present, a further two visits are required to determine the population size class (total six visit). Surveys can only be undertaken between mid-March and mid-June and half of the survey visits must be undertaken between mid-April and mid-May. Surveys can only be carried out when the overnight temperature remains above 5ºC and the evening weather is dry, with light winds. Surveys typically involve setting bottle traps in late-afternoon or early-evening; carrying out a torchlight survey after dark; emptying the traps the following morning; and conducting an egg search. A netting survey can be used as an alternative to any of the above methods but is not usually preferred. A PSCA is required where GCN are known to be present, as it is important to understand the population size class to influence the mitigation design. However, this approach is time consuming and more costly than eDNA. If GCN are present, some form of mitigation is likely to be required. BWB can advise on the most appropriate mitigation strategy on a site by site basis and will work with the wider project team to minimise impacts on the development. Mitigation could include avoidance of certain areas, presence of an Ecological Clerk of Works, removal of GCN from the site under a licence, creation of new habitat or contribution to off-site habitat creation. See our full Ecology Survey Calendar here.